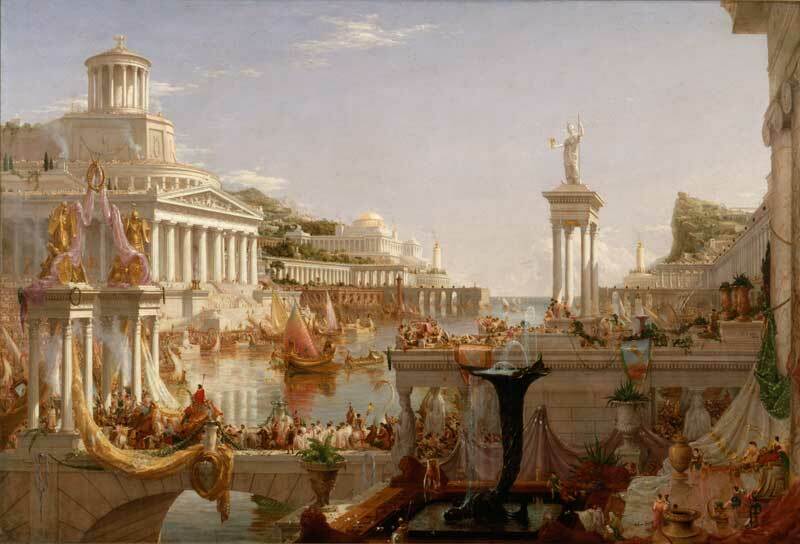 In 1836, Thomas Cole completed his erudite, Byron-inspired, sublime and slightly foreboding five-painting series ‘The Course of Empire’ in his Catskill studio in America’s east coast Hudson Valley. At that time, the city of Los Angeles and the rest of California, 3,000 miles away on the west coast, was Mexican territory (they were ceded to the United States 12 years later). Today, the city is one of the USA’s largest with a core population of 4 million spread over 470 square miles. It has made its own story, has its own pioneers, its own cultural history: to a visitor it feels more part of the Pacific Rim than of the historic, Euro-centric east coast. So the arrival at the Los Angeles County Museum of Art (LACMA) of 45 top-flight landscape paintings by the 19th-century Hudson River School artists, loaned by the New-York Historical Society, can almost be seen as show of foreign art. The pictures tell the story of east coast Americans’ ideals of discovery, exploration and settlement in idyllic pastoral settings. The artists took as their inspiration European painters such as Lorrain, Constable and Turner, and local American philosopher-writers such as Emerson and Thoreau. Their monumental paintings depict man and virgin nature coexisting in harmony. They are especially poignant because they were painted at the moment when the Hudson Valley was beginning to have the edge knocked off that purity by industrial development. Nobody can agree on who coined the ‘Hudson River School’ name. The artists also took their paintbrushes to New England, the American West which was being settled at that time, and even to California’s Yosemite Valley and South America’s Andes Mountains. But it is agreed that Thomas Cole was the group’s founder. Born in Bolton, Lancashire, in 1801, he and his family emigrated to Ohio in the USA when he was 17. Having learnt portrait painting, turned to landscape, and studied at the elite Pennsylvania Academy of Fine Arts in Philadelphia, Cole moved to New York in 1825. He was part of the group of artists and architects who founded the National Academy of Design (still thriving today, on Fifth Avenue) the following year. It was during a steam ship trip up the Hudson in 1825 that he painted his first landscapes of the area, tinged with glowing autumnal colour. It marked the start of what some consider to be the first home-grown artistic movement in the USA. Asher Brown Durand, Cole’s close artist friend, followed his lead. After Cole’s premature death in 1848, the movement gained momentum with a second generation of stars such as Frederic Edwin Church (whose hilltop home overlooking the Hudson is open to visitors), Albert Bierstadt, John Frederick Kensett and Sanford Robinson Gifford who produced their best work between 1855 and 1875. Their pictures helped stimulate an American version of the European Grand Tour, and the founding of America’s network of national parks. 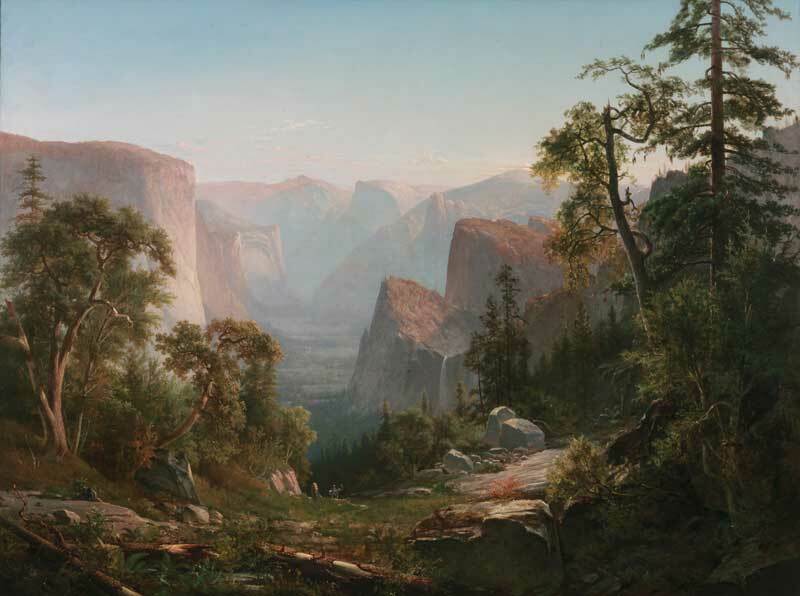 The LACMA show’s paintings present ravishingly beautiful parts of the USA that remain untamed: awe-inspiringly grand, forested and lush, rugged and romantic, with panoramic views free of factories, towns or any buildings at all. They interpret the idea of the sublime in a particularly American way. And they make you want to head off to enjoy them right now. Cole’s ‘The Course of the Empire’ series is here, the epitome of realism subjugated to idealism and sublime beauty. 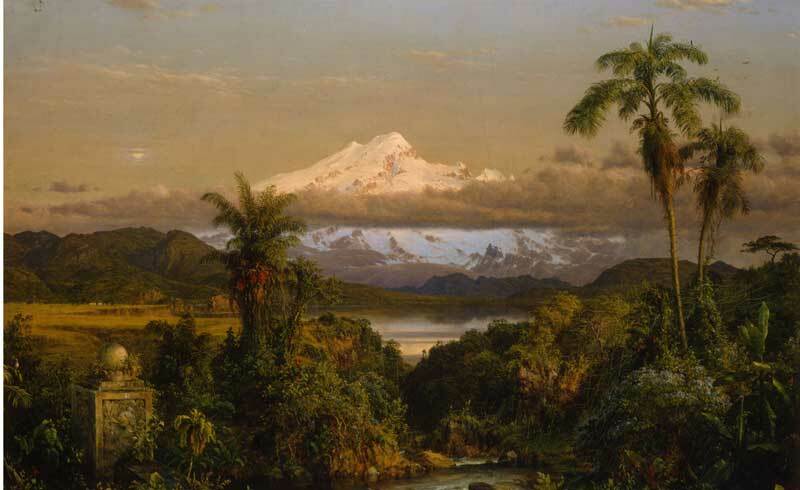 So too is Louisa David Minot’s Niagara Falls (1818), then a burgeoning tourist attraction, and Church’s Cayambe (1858), showing the moon rising in exotic, tropical Ecuador. But it is perhaps Bierstadt’s Donner Lake from the Summit (1873) that encapsulates the movement. Celebrating the completion of the transcontinental railroad in 1869 which connected American people coast to coast, the epic 183 x 305 cm painting puts nature centre stage, not man’s achievement building the railway line. First unveiled in San Francisco, 600 people paid to see it each weekday, 1200 on Saturdays. Will LACMA draw such crowds? 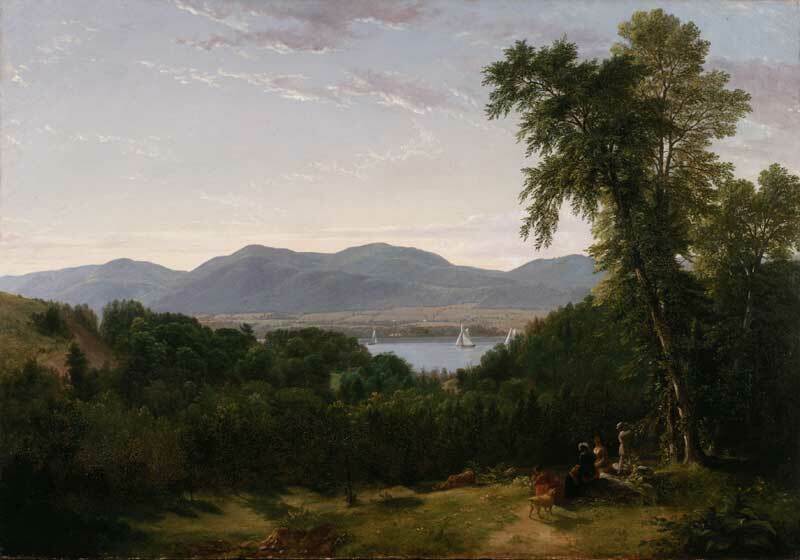 ‘Nature and the American Vision: The Hudson River School’ is at LACMA, Los Angeles, until 7 June.